Let’s end the blog’s lengthy recess with a report on a recent event. Scriptus, the Toronto pen show, held their 5th annual show last weekend. It was my second visit to this show, and I enjoyed my time there. The new library represented a remarkable shift. The books were out in the open! For the first time, the public could see and touch the reference books without a gatekeeper. 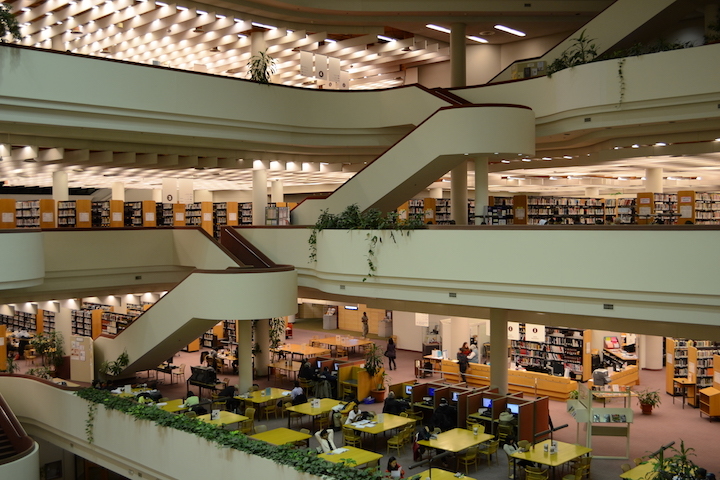 The building was also like no other library the city had seen. It seemed to have no walls. Designed by Canadian architect Raymond Moriyama, the floors were concentric wavy circles, and the whole building seemed like an open vessel. For better or worse, I spent many hours of my teenage years there. The pen show is in one of the areas not regularly open to the public. A theatre, there are some interesting views of downtown from the windows. They also offer quality programming. For example, you can hear John Irving speak next month. The show is free, and consists mainly of display tables that are rented by vendors. The show was crowded – much too crowded for my taste – but better than 2017. Vintage pen dealers seemed to use the most space, followed by new pen dealers, often occupying several tables. Then people selling pen accessories, journals, notebooks, and various organizations. I found almost no woodcase pencils at the show. 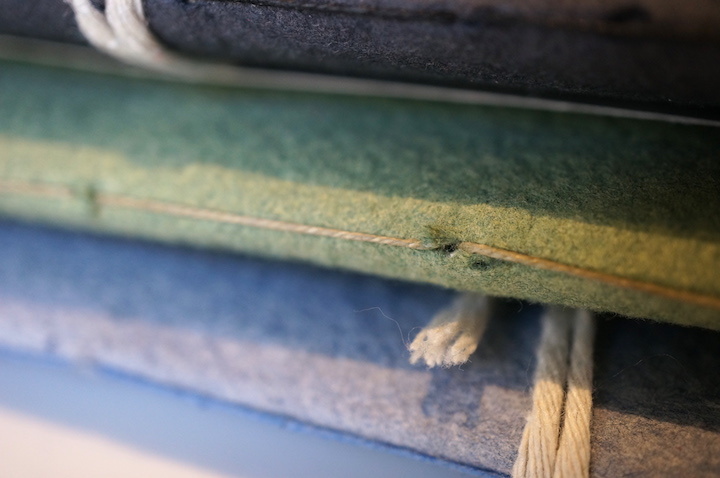 I did find a number of craftspeople, including people with professional bookbinding skills. I bought a small distressed leather book from Don Taylor Bookbinder. It contains Tomoe river paper. While I now wish I’d bought more, I think the small book will offer a good chance to see if I like the paper and to learn how the binding performs over time. 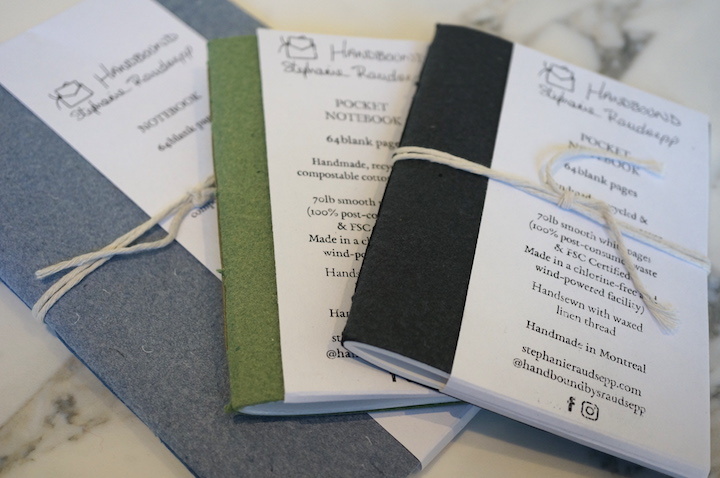 Stephanie Raudsepp from Montreal was visiting, and she makes thoughtful notebooks that aren’t just recycled – they are chlorine-free and made with wind power. I bought three, with the idea that a couple of them may become gifts. 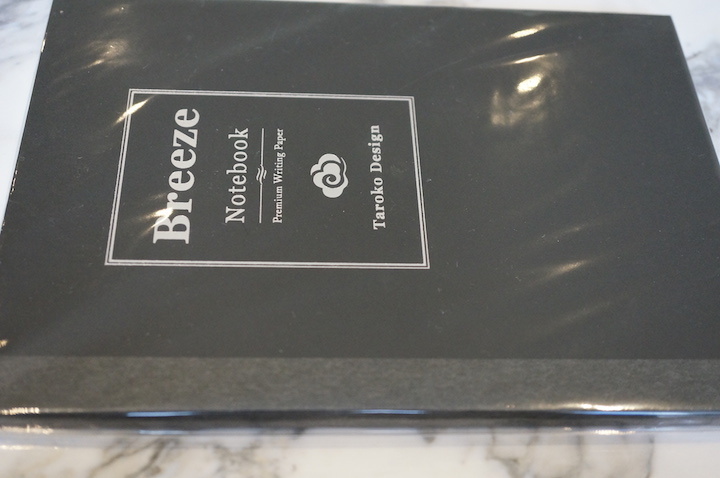 I also bought a Taroko Design Breeze Notebook, whose packaging was quite professional looking. All the paper vendors allowed visitors to try their paper. And these weren’t just “staff” – the actual artisans were there in person. Where did all these skills come from? 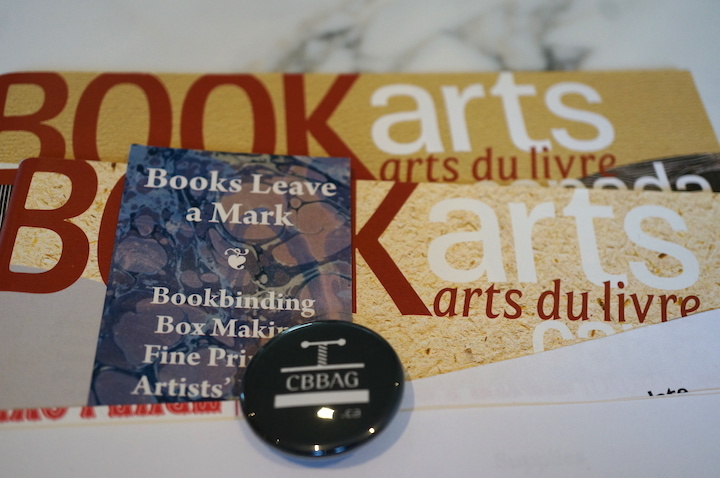 I enjoyed visiting the table of the Canadian Bookbinders and Book Artists Guild. I bought a very small $2 kit from them, and got some back issues of Book Arts magazine. 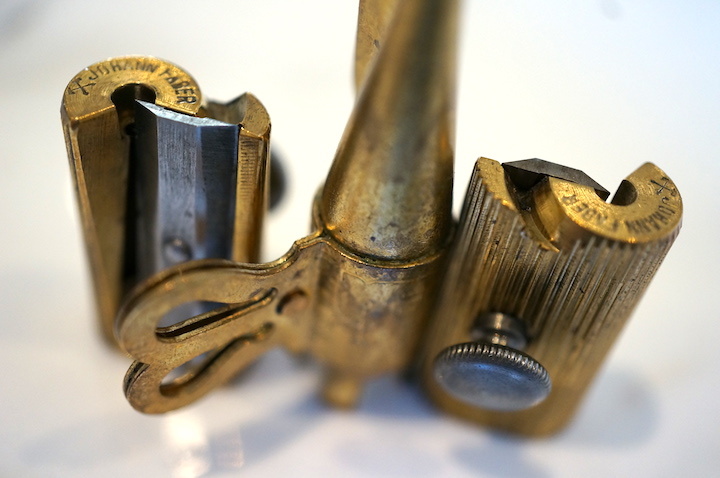 Oh, I said there were no pencils – but there were pencil sharpeners, courtesy of an antique dealer. 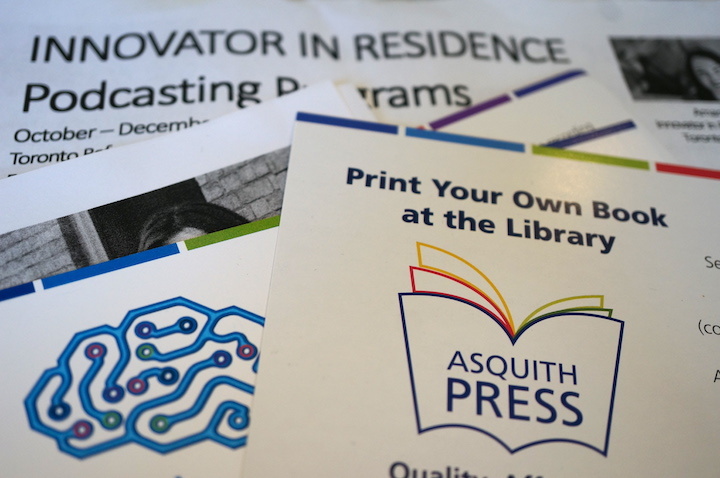 And some more about the library itself – exiting the show, I noticed that the library now has 3-D printers, a print your own book machine, notices about an entrepeneur in residence, and other new features on the main floor. That floor used to house core reference materials such as dictionaries, enyclopedia, directories. I’d like to explore that print your own book offering! And – there is a small retail area near the main exit with a coffee shop and a small bookstore. All food and drink (possible excepting water) used to be forbidden from libraries, and a bookstore (not just a small gift shop) inside a library seemed odd. But the businesses are not run by the library – they are tenants in the retail area. And the bookshop has Faber-Castell Document pencils and oversized 870 and 871 Castell marking pencils. These are super rarities of the modern catalogue – and there they were. Some other notes. The event, free and set in a library, could have been accompanied by more education (other than just “retail education”) about pens. I recall being taken to a coin show as a child, and it had lectures, displays, etc. – not just a retail bourse area. I also met other stationery bloggers in person for the first time. The event had various pre-events, and I thoroughly enjoyed meeting Ana Reinert from The Well-Appointed Desk and Brad Dowdy from The Pen Addict. Hard to believe this took so long. I thought I’d meet another pencil blogger first. I wonder if the show could support a pencil table? In comparison to buying a handmade notebook or a vintage item online, a show like this is a much better experience due to the ability to test and handle the products in person. Talking to the person who made the product makes it even better. Have you gone to a pen show? What did you think? A small trip report. 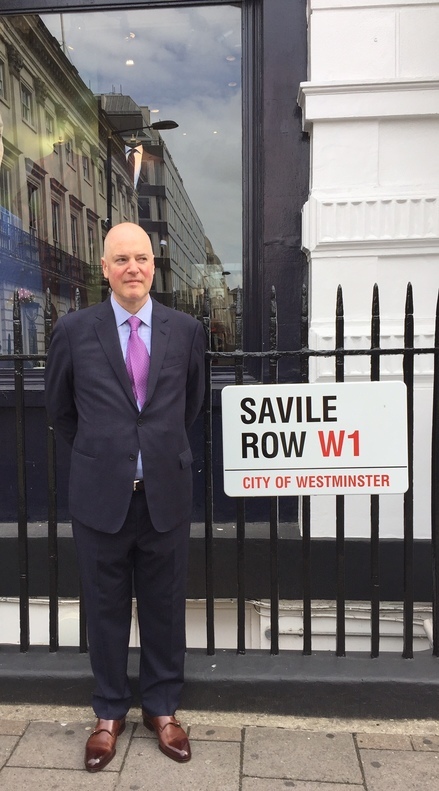 It was a privilege to visit Glasgow and London in September. I loved the trip, and felt very much at home. 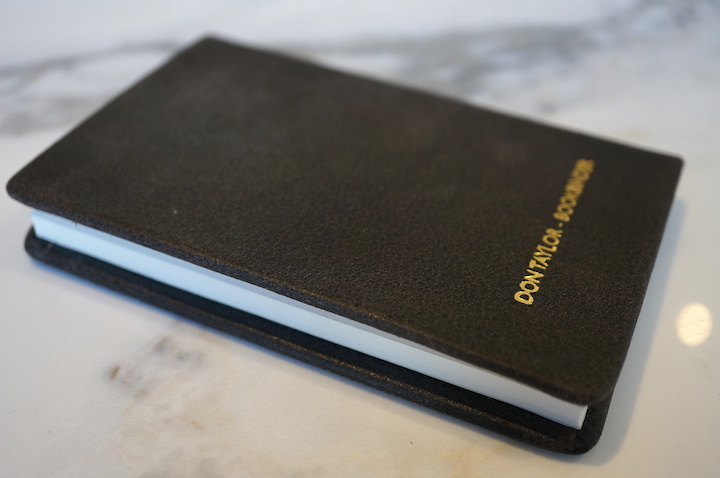 I was fortunate to meet a Scottish writer and actress who is creating a film project with a strong postal element, an English author and Savile Row tailor, and tour Gordon Ramsey’s kitchen post-dinner, but this report is about stationery. My first pencil: After taking Virgin Trains from Glasgow to London, my wife and I decided to not plan, fearing we would be quite knackered. We were right. We randomly found Smith & Whistle, where we enjoyed a surprisingly pleasant dinner. To my amazement, there was a small post-cheque treat: a lollipop, a themed calling card, and a pencil! I’ve never heard of a restaurant pencil treat, but it set me up nicely! Art galleries and museums were delightful. 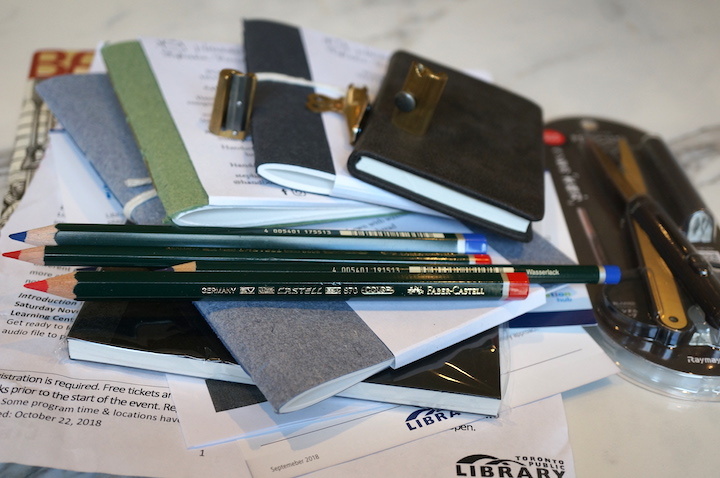 Gift shops typically had branded pencils and notebooks – but usually without attribution to the manufacturer, or recycled pencils, etc. Readers of this blog may imagine that over time – I have enough of this stuff, and declined to purchase these. These shops excelled in their book selections – super interesting, curated, engaging. I am or have been a member of several museums and art galleries around Southern Ontario and Northern California – and the bookstores at the Tate Modern and Design Museum seem to be a level above. The Design Museum had an exhibit focusing on the industrial designs of four companies – Apple, Braun, Olivetti, and Sony. Choosing Keeping has an exemplary pencil selection – the Bosco Woods side by side with the Lothar Faber anniversary pencils. And they know the field. I enjoyed hearing their perspective on the industry. They are also an exceedingly tiny store. Did I buy anything? Yes. I hope to feature some purchased items in the future.